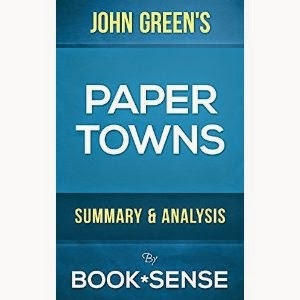 "Summary & Analysis of 'Paper Towns'" by Book*Sense is an excellent read for anyone looking for a thorough yet concise look at the book. I read the book for a book club and used the guide to brush up on the details of the story the night before club's meeting. I feel this summary and analysis book worked excellently for this. The summary & analysis is broken into easy-to-digest sections, such as Setting for the Story, Story Plot Analysis, Character List, and more. The writing is succinct, with no fluff, yet covers the important stuff. Definitely a good buy for anyone looking for a solid summary and analysis of "Paper Towns."